It's birthday weekend for the Missus so I took her to London Zoo and we saw the lion cubs and they're breath-takingly sweet and beautiful. We also had a wonder around the new Gorilla World, which was pretty cool, and did the rest of the stuff, such as the Reptile House and the Aquarium. 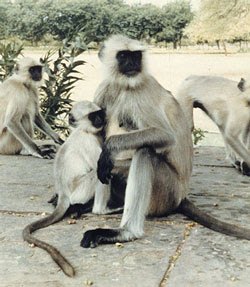 My favourite new find, however, was the Hanuman Langurs. These are very cute monkeys from India and they're considered sacred by Hindus. They're both playful and quite serious looking and I've decided these are now my favourite monkey of choice. It was quite strange walking around London Zoo on our own and without a child to take and show things. The Missus used to take the Boy when he was young and it served as yet another reminder that he's now no longer the Boy and will be wending his own way into the world very shortly. 'Does it feel strange not having a child with you?' I asked as I realised we were the only people without one. 'I wouldn't say I was totally without a child,' she replied as she looked at me before wiping the chocolate from my ice cream off my nose.